December is my favourite month of the year. December is also a tough month for me. December is the month of mixed emotions – December is the month of love & loss. As you get to know me more, you’d know eventually know why I feel so. But even more than usual, this is the month when I feel all my emotions in its highest possible magnitudes. It is as if all of my senses are on an infinitely stimulated state, where I laugh loudly at silly jokes, smile at complete strangers, scream at the top of my voice, and break down way too easily looking at photographs. Again, as you get to know me more, you’d know why. December is the month of holidays, of spending time with your loved ones, of caring and sharing, of thanking and loving, and most of all, going home. And that’s when I realized, I Don’t Have A Home. I spent the first six years of my life in West Bengal, a north-eastern state in India, widely known for its love for literature and arts, and its panache for beautiful poetry and a laidback lifestyle. I ate a staple lunch of Maccher Jhol & Rice, a simple delicacy that I have completely stopped eating today. Those years where I cried my eyes sore because my father forced me into getting a short haircut and where I breathed in the fresh & thrilling air of the Ganges from the huge terrace of my house, was what I used to call home. But it is not my home anymore. I want to call it home, the place where I slept those nights under the mosquito net, looking out of the window at that neighbour’s house, and falling asleep as the neighbours squabbled. But as much as I want to call it my home, I feel like I have left it all behind me. The people living in that house are pretty much the same, they lead very similar lives today to what they used to back then, and it is me who has changed, who has moved on, who has left behind all that was mine. I am still the proud daughter of that house, but sadly, and truthfully, it is not my home. We moved to Bombay when I was about thirteen years old, and suddenly, Bombay was what I began calling home. I found everything about Bombay way more fashionable than I had ever experienced. Even if it meant, adjusting room in my stomach from a bit of that fish-curry and eating vada pavs on the road-side. My father had bought a new apartment when we moved to Bombay and I was old enough to decorate my room in my way. I plastered the walls of my room with pictures of Sourav Ganguly, Shahrukh Khan and for some strangely weird reason, Abhishek Bachchan (embarrassing decision in hindsight). I even managed to print my own photographs onto A4 sized sheets and decided to paste them on the wooden doors of my book-shelf. The book-shelf itself bore the weight of my entire childhood, witnessing the addition of books from time to time, being a silent admirer to my heartbreaks when I pulled out my diary from the shelf to write off some boy who had hurt me and being a sturdy companion when I hid my love letters under the fat organic chemistry book (which even today looks nearly untouched by the way). I called that home. That address became the permanent address on my passport. I felt a strange sense of comfort and love for this home, despite it not being perfect at all times. I just felt that I always had a home somewhere in this world. 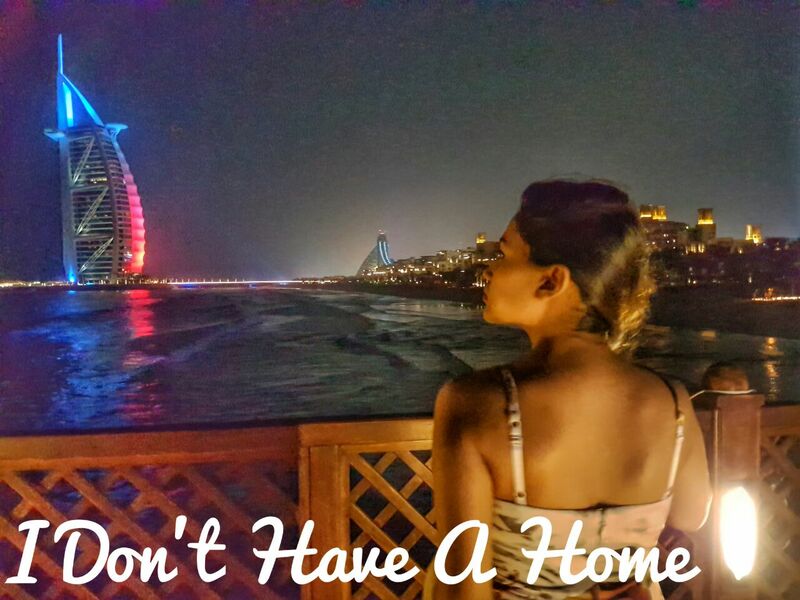 Even when I moved to Dubai for studies and then work, I always knew what coming home felt like. I even remember surprising my family one night, when I flew down from Dubai unannounced and ended up at the doorstep with my luggage in tow. I knew I could do that. Even then, the biggest woe that my grandmother had was that because of this surprise, she did not have enough time to cook my favourite things. My room would be just how it was during my teens. The pictures and posters were still plastered, maybe wilted and faded because of the test of times, but still there. This is the home where I first fell in love, started writing. This is the home whose balcony bore the drama of my relationship, as my then-boyfriend (and now husband) would turn up in front of my house in the middle of the night and I would run to my balcony to see him. But I left this home too – The day I got married. I still remember sitting with my grandma, packing up my whole life into suitcases. I gave my old clothes, old books and my old life away to anyone who would keep them safe. I just took the necessities, the books that I absolutely could not live without, the dolls that I just couldn’t give away, the decade-old sarees that were inexplicably heirloom and the five kilo bag of greeting cards and gifts of our dating days. I gave my room away to my brother, and being the sweetheart that he is, he has still not taken off the faded printouts of my photographs from my book-shelf. I carried the weight of my whole life and dumped it all at my new house – The house of the guy I was marrying. I was worried, and a little scared – Would they understand my need to keep these things? Am I creating unnecessary clutter at their place? Would there be enough space for all my things? – You see, it was still their place and I am not sure I can ever call it my home. Sure, it is lovely. I am loved there. It is much more luxurious than any of my houses. But, who said that luxury can buy happiness? Or comfort? Or that sense of emotional allegiance? I am not cynical – I will probably call it home one day. But it will take time. Today, I live in the magical city of Dubai, and boy, Dubai is the place to be in December. Every day in December in Dubai is a celebration in itself, and the inhabitants love to make the most of it, as they very well know the opposite of winters in Dubai. I live in a very comfortable house here – The view is to die for. It is quiet, serene and mesmerizing. The flooring is wooden, just the way I like it, the furniture is IKEA, just the way I planned it to be, and the sheets are perfect for an afternoon nap, just the way I do it. This is the house I live in, the house I have paid for and the house I have created. There is no sense of entitlement here. There is absolutely no sense of inheritance. I like it here because it reminds me every day of the things I have achieved and the person I have become. It reminds me of our struggle, and the years we spent together loving each other, despite the fall-outs of fate. It reminds me of the days spent making business plans and the midnight trips to the kitchen to make mug cakes. But when I told my hubby the other night that I wanted to go home, did I mean, this home? Then where is my home? Where do I go, at the end of an eventful era, to call a place that is truly my home? They say, home is where the heart is. If I really think deep down, I think I know I can build a house which could be my home and where my heart could reside too. My home would be a large house, with rustic interiors, four-poster beds and sheer curtains. My home would be where there are lots of people living in it. We would have elaborate family breakfasts and plan for picnics together. My home would have walls that would have paintings made by its dwellers, photographs of people who touched our lives once and amateur pieces of art created by children. My home would smell of freshly baked cookies in winter, and of mustard oil laden pickles in the summer. My home would have children, playing with each other and helping their mothers out in the kitchen. My home would have an entire room for books, and greeting cards, and faded roses and memories, and it would be a place where one could go in and remember all the homes they have ever lived in. I want my home to be home to all my loved ones, where my grandma would sunbathe my toddler in the mornings. I want my home to have large flower vases, for my husband to be the lover that he is, to bring me those red roses every now and then. But I Dream of Having One. And I Definitely will build it one day.